Here's my Anthro inspired scarf/shawl. Actually it's the cluster of balls at each end of the scarf that's really inspired by Anthro. The running stitches on the scarf are from me, but who are we kidding? It's all about the ball cluster that really makes the scarf =). I didn't line this scarf/shawl, because I wanted a light weight feel to it. However, come winter, I'm anxious to double up on the fabric and try some reversible ones. And as I said before, these will be great Christmas gifts - fast, simple, and handmade. Perfect! If you're interested, below is a tutorial on how to make this scarf/shawl. ~ Pom Pom balls: At least 1 bag of the small size. Had I had another bag, I would have added a few more balls. Fabric: Cut the 2 yards of fabric in half lengthwise (along the already existing fold in the fabric). Note: the 2 yards should not be cut in half making it 2 separate 1 yard cuts. Instead, you should have 2 separate 2 yard cuts of fabric that are approximately 22" in width. You will only need one of the 2 yard pieces for the scarf. 1) Finish the raw edges of the fabric. I used a rolled hem stitch with my serger. If you do not have a serger, you can simply fold under the edges (wrong side to wrong side) a 1/4" and fold a 1/4" again. 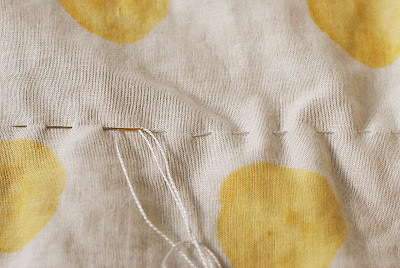 Stitch along the fold line. 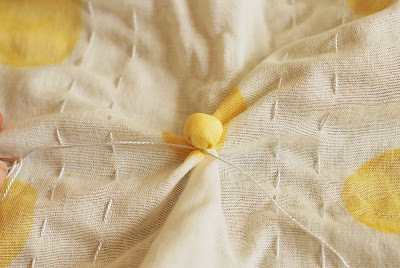 3) Before you knot off the end of each running stitch, gently gather the fabric by pulling on the floss and sliding the fabric. Gather the fabric just a little bit. You want to create a little movement in the fabric. 4) Knot the ends of the floss. 5) Place a pom pom under the fabric (wrong side of fabric). I placed mine approximately 6" up from the end of the scarf and in the center. 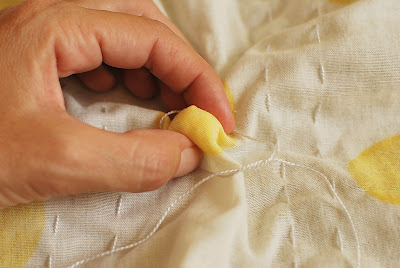 6) Cover the ball with the fabric and pinch or twist the bottom. You want to be able to see where the bottom of the ball is. 7) With the floss, tie a circle (do not knot it) and place it around the ball. 8) Tighten up the tie and knot it at the base of the ball. 9) Repeat steps 5 - 8 for the rest of the fabric balls and arrange them in a cluster. Make sure you save half of the pom poms for the other side of the scarf. Helpful hint: If there is too big of a space between 2 balls, simply tie them together with some floss. It super awesome and oh so simple! Love it! Thanks for a brilliant tutorial. I love it. Jamie -- this is so cool! Thank you so much for sharing! We have been having an awful summer here in the northeast so this shawl/scarf is perfect! Have a great weekend. Oh my gosh, I totally thought that scarf was something expensive and designer... but you made it! AND you've given us a tutorial. How nice are you?!!!! That is the best, I love the shawl look the most I think, and those little cluster balls are so clever! I have two pieces of gorgeous thai silk that my mother gave me. (From my grandma, who received them from my aunt who was in Thailand for a while.) One is paisley (!) and I *really* want to turn it into a shall now. Yum! I absolutely LOVE this idea - I've really been wanting to buy a scarf, but this is so much better. I'm just re-starting my crafting, & this is a great project to add to my quilts. Thanks much for the tutorial. A very simple idea with a very nice result :o) ! 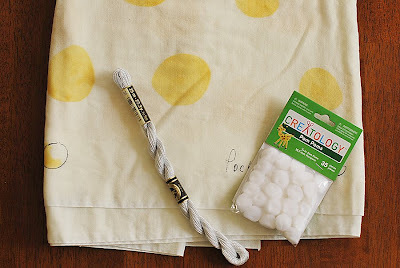 I'm definitely bookmarking this for Christmas projects...it's never too early to start! Hi Jamie! I'm in love with this! 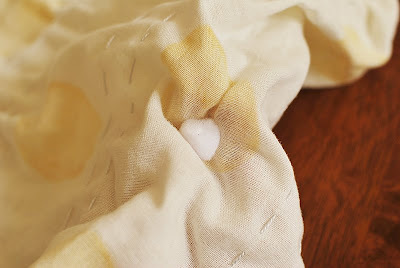 I have a question--do you think the Echino linen/cotton blend (i.e. 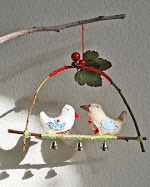 birds to hang, migratory birds) is too heavy to make this? Just curious if it would work. Thank you! Thanks everyone for letting me know you like the tute. Amy Jo - Good question. I think it may be too heavy for a scarf, but as a shawl it would look DOPE! I may try one out in that fabric and if I do, I'll be sure to post about it. Had to see Anthro site to see the scarf, & wow yours looks great! I don't know how you came out with the idea, from the picture, but thanks for sharing the tutorial. I think it rocks! Love it! Different topic: Where can I find a cute Cardigan Clip like the one you're wearing in the picture with the white cardigan and lime green "Honey Girl" dress? ? They are hard to find, and I love the look! Sara - I love that sweater guard. My mom bought it for me at an antique store. I have found some on etsy by doing a search for "sweater guards". You can also do a search on google. I love this! I want to make my own scarf now. Very cute. I always want a scarf from anthro but not for the price. I love the stitching and ball embellishments. Very chic!. I can see a skirt using these ideas. The stitching going vertically and the ball clusters trimming the bottom creating a waving hemline. Very inspirational. Oh! My! Gosh! I am IN LOVE with your blog!! I found it a couple days ago while searching for shirring tutorials. I followed your directions...and voila...I made THE CUTEST top! Thank you so much! I can't wait to try my hand at the scarf. This is GORGEOUS! So perfect for an upcoming wedding. Thank-you soooo much! You just made my outfit! I'll be linking. This is so cute! I want to sew pom-poms into everything now! I love it!!! What a beautiful shawl and the pompom popcorn whatchajiggies add such an interesting texture--brilliant! Holy Heck, this is cute. I have a dress with tiny cherries on it that I bought at Goodwill for the fabric....I see a project in my near future. Thanks! how beautiful! simple yet stunning. I LOVE this! 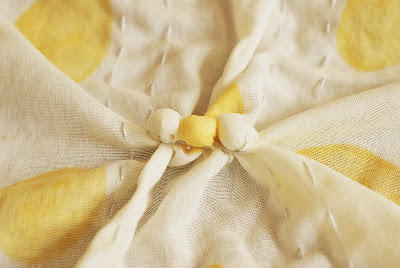 I bought a pretty summery scarf recently, but adding these touches to it would make it divine!! thanks so much. I found your blog via twitter and will be subscribing. have a great day! The scarf is beautiful! And it's a great tutorial. Thanks for sharing! Awesome tute! I saw this type of scarf a while ago in a very expensive art store and loved it but couldn't afford it...you're a gem for sharing! I'm just in love with this. Everything. The little fun balls. The bright yellow fabric. A breath of fresh air. Thanks! This is tottally cool Is it really as simel as it looks? wow! I am so impressed, I so want to do this! thank you for the fantastic directions, what a treat!! Wow! I have been looking for a scarf like this for so long. I was in Paris with my mother in a jewelry store and we saw a scarf exactly like this and it costs 50 euros! Ever since then I have been trying to find the scarf for cheap but yay!! Now I can make the perfect scarf for my mom, thank you so much! I'd love to make this. What other fabrics can I use since I don't have that beautiful cotton gauze you used? Wow, what a beautiful scarf and so unique! Thanks for the tutorial! BEAUTIFUL!!!!! I am in love with this scarf. I'm not much of a scarf person but I love the idea of wearing this as a shawl. I'm thinking Easter! 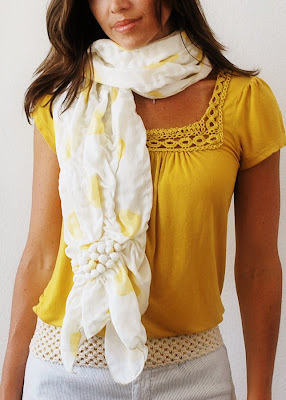 I am so excited to try this DIY: I live in scarves! thanks for sharing! Absolutely gorgeous! I can't wait to try it. Thank you for the tutorial; I'm going to link to it. actually many things you learn reading this blog, curiosities and things related to art and creativity! Congratulations and keep doing that are very good ..
Hello simple fabric scarf are so good cause they really look nice nice colours . Love the simplicity and charm of the scarf. Just discovered double gauze and am looking forward to creating some wonderful garments with it. 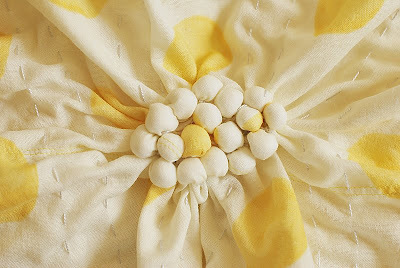 Will share your tutorial with our crafty customers at www.jofabrics.com! It's so cool scarf! I never can make same by my own. Another great tutorial. I liked it very much. I will surely try to make it similar one for me as well as. I am looking for finger ring tutorial from long time ..do you have any stuff related to this ..? Thanks for the tutorial! This scarf is really cool! What an awesome fabric scarf! maybe the most incredible stuff I've ever seen in my life so far! Thank you for a brilliant tutorial. This scarf is really cool! Beautiful scarf and wonderful instructions! A couple of the comments discussed a sweater guard, but I'm not sure I see it. Is it in the photo that features that adorable hat where the scarf is worn as a shawl? Is the "sweater guard" what makes it gather around the waist? Perfect styles and ideas. I'm gonna make a try for this. I used a ready made scarf and used your instructions adding the balls and running stitches and it looks great.